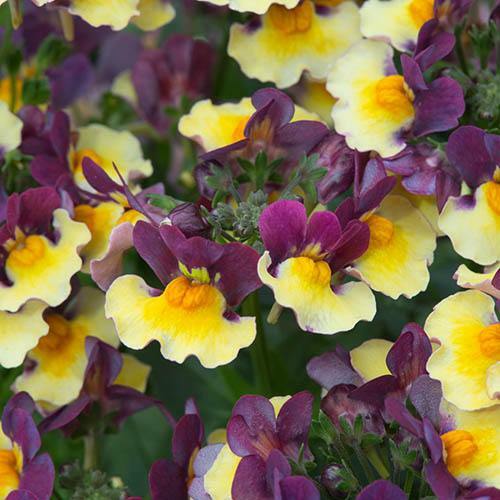 With its delightful deep violet and gold flowers, the sweetly scented, two-tone 'Rhubarb and Custard' flowers of this choice Nemesia appear from early summer and will just keep coming right up until November - that's six whole months of colour. The strong and heady perfume is wonderful on a warm summer's day, so be sure to grow in a place where you can appreciate the fragrance. With a neat , semi-upright habit, 'Rhubarb and Custard' is perfect for taller containers and even hanging baskets where the flowers will tower over the edges and create a dense, floriferous display. Versatile, they make a lovely border plant too, especially when planted en-masse where they'll create a real impact. Easy to grow Nemesia thrives in cool or hot weather and tolerates a little frost too, so stays in bloom much longer than many summer plants. Offered as a pack of six jumbo plugs, plant directly into tubs and baskets or pot into 4in pots before planting into the flower border. Supplied as a pack of 6 jumbo plugs. Plant directly into tubs and baskets or pot into 4in pots for 3-4 weeks before planting into the border.